Humans can acquire Toxoplasma gondii infection by inhalation or ingestion of the oocysts passed in cat feces. 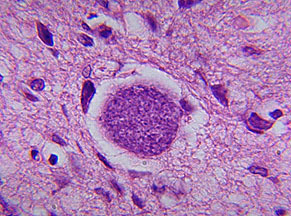 In humans, the tachyzoites (trophozoites) are obligate intracellular parasites. 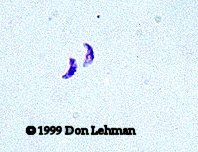 The tachyzoites (at right) are crescent-shaped and measure about 5 µm in length. They can be found in a variety of tissues including lung, lymph, and buffy coats. Cysts (shown at left) are strongly periodic acid-Shiff positive and form during the chronic stage of disease. Once cysts form, the disease enters a latent period with few if any symptoms. In immunocompromised patients, the cysts can rupture or re-exposure can lead to severe lesions. Cysts are frequently located in the central nervous system.